Do you like pecan pie? It’s one of those things people either love or hate. And I love it. 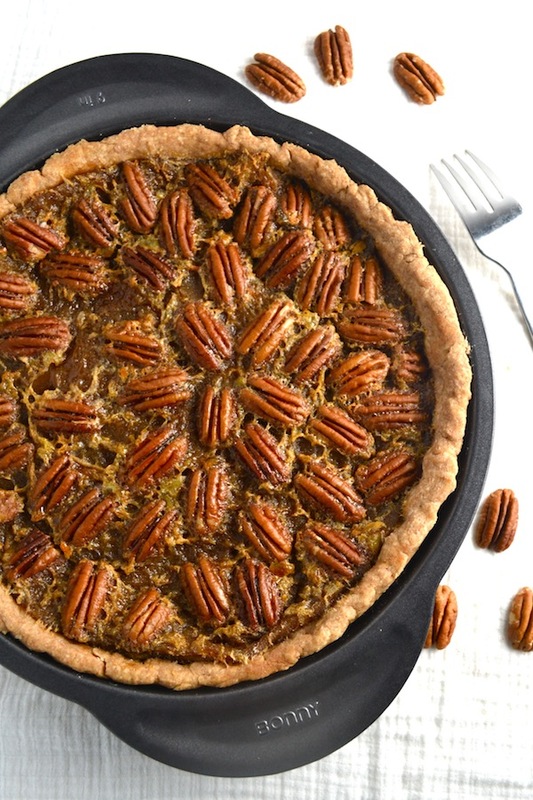 This version of pecan pie is a bit healthier than your standard pecan pie. 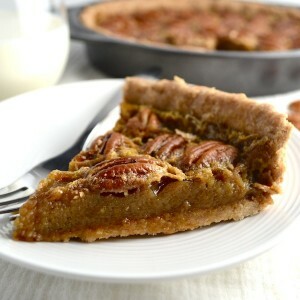 Most recipes include corn syrup and brown sugar and use a refined white flour pie crust. This recipe uses maple syrup, unrefined sugar like coconut or date sugar, and a sprouted spelt pie crust. 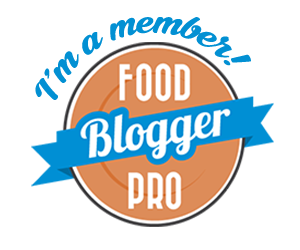 Do you like dessert recipes that are adapted to be healthier? Or do you like your dessert as is…the original recipe. I know people that would rather eat less dessert and go all in when they do. And I can understand that. I usually like adapted recipes though because they’re not as sweet and they use whole grains, which have a different flavor than refined flour. I’ve come to prefer the taste of sprouted whole wheat grains. So, I don’t feel like I’m giving up delicious desserts by eating healthier desserts. Especially not with this recipe. It really is so good! 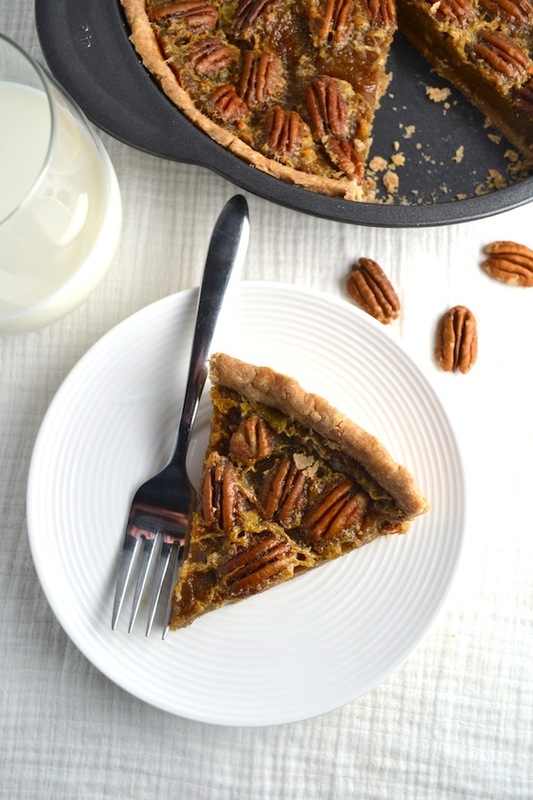 I got this Maple Vanilla Pecan Pie recipe from Nourished Kitchen and adapted it a bit. I love Jenny McGruther’s recipes and this one does not disappoint. 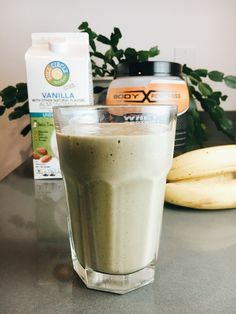 I use One Degree or To Your Health sprouted spelt flour, Redmond Real Salt, Fatworks pure lard, organic maple syrup, organic coconut sugar or date sugar, and butter from pasture-raised cows. You can use sucanat instead of coconut or date sugar too, I just don’t like the flavor of sucanat as much. 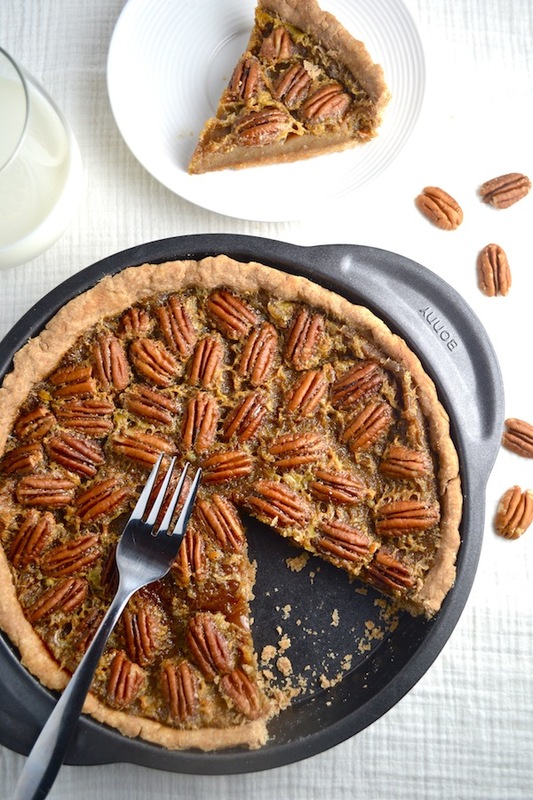 I think you’ll really like the flavor and texture of this maple pecan pie. It’s a great one to have in your dessert recipe quiver! Place oven rack on lowest position. Put the flour and salt in a bowl and stir together. Add the lard and continue to stir together with a fork or pastry cutter until the flour resembles corn meal. Add the cold water and stir until the dough forms a ball. You may need more or less water, so add the water slowly. Flour a clean countertop and roll the dough into a ⅛ inch thick circle. If it's too sticky, place the dough between two sheets of parchment paper and then roll it out. Or put it in a Ziploc bag and roll it out then cut off the sides and peel the plastic off. Place the dough into a 9 inch pie pan and put it in the freezer while you're preparing the remaining ingredients. In a large bowl, add the eggs and beat them. Add the maple syrup, sugar, melted butter, and vanilla. Stir until fully combined. Remove the pie crust from the freezer. Arrange the pecans on top. Bake until the crust is golden, but the center is still wobbly, about 40 minutes.